80% of women believe that mainstream products are made from cotton. They’re not. Periods are natural. &SISTERS believes feminine care should be too. Periods are natural. &SISTERS believes that feminine care should be too. &SISTERS has just launched a range of 100% natural and ultra-reliable organic cotton products that are better for our bodies and better for our environment. And what’s more you can buy any combination you like. Customers customise their period pack online from a selection of different products and absorbencies and have them delivered to their door (or desk!). &SISTERS is a company with a conscience and is donating 10% of profits to help tackle period poverty around the globe. - Manufacturers are happy for things to stay that way: If they were obliged to list their ingredients we’d find out about the processed synthetic fibres, non-biodegradable superabsorbent polymers and plastic that most products are made with. And the chemical-bleaching too. - Women want things to change: The current trend is for clean beauty and women are increasingly looking for natural and gentle products, scrutinising the labels on toiletries as intently as those on food. - Customisation is key: Only 24% just use pads, and only 15% just use tampons. Most women use a combination and want packs with a mix of product types and absorbencies. What’s currently for sale lags behind what women want. &SISTERS gives women a choice of products that are better for their body, better for the planet and better for womankind. - Better for the body: Natural and ultra-reliable tampons, pads and liners made with 100% certified organic cotton. ** Free from chlorine, perfumes, viscose, superabsorbent polymers and other nasties. Hypoallergenic and pH neutral so ideal for sensitive skin. - Pick-and-mix products: Women can customise their packs with the ideal combination of products (tampons with or without biodegradable cardboard applicators, pads and liners) and absorbencies (very light, light, medium and heavy) to suit their period. 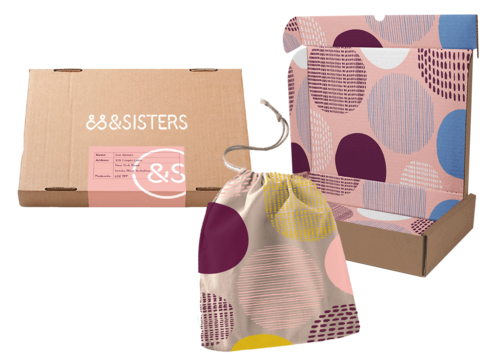 - Sit back and relax: &SISTERS eco-friendly letterbox packs are delivered direct to doors (or desks!) as often as every month, every two months or whenever customers ask them to. Products arrive in a stylish, cotton bag. As a start-up, we're very open to reader offers, free samples, competitions, product reviews, blogger outreach campaigns etc. We have some super sample packs and bags, so please do get in touch if you have a primarily female audience and you think your readers would like these. Data from Mintel†† shows the feminine care market in the UK is worth GBP280m, with 68% of (18.5m women) using period products and/or liners on a monthly basis. Pads account for 52% of the UK market by value, tampons 29% and liners 19%. The &SISTERS’ core audience is women aged 18-39 (9.2 million women) who like to take care of themselves and care about their bodies. This group is focused on the health benefits of products, spending more on natural and organic beauty products. However, the sweet spot is the 18-25 year old age group (3.2 million). This group are most concerned about environmental impact and familiar with clean beauty and clean living. Sustainability is increasingly on every millennial female’s agenda. &SISTERS certified organic products are sourced in Europe and packed in London. &SISTERS offer women a choice of 100% natural and ultra-reliable organic cotton products that are better for their bodies and better for our environment. Customers choose their own period products to match their needs and &SISTERS delivers direct to their door or desk! And, because no woman should be held back by having periods, we give 10% of our profits to tackling 'period poverty' around the globe. Feminine care with a conscience. &SISTERS Better for your body, the planet and womankind. This press release was distributed by ResponseSource Press Release Wire on behalf of &SISTERS in the following categories: Health, Women's Interest & Beauty, Retail & Fashion, for more information visit https://pressreleasewire.responsesource.com/about.